Inspiring women and girls are all over the world, and photographer Asher Svidensky found one in the Altai mountain range of western Mongolia. Meet Aksholpan. The 13-year-old girl may be the only female apprentice learning the art of hunting with golden eagles known as kusbeguy. BBC reported Svidensky's story about photographing teens learning the skill of hunting with hefty golden eagles and meeting Aksholpan. 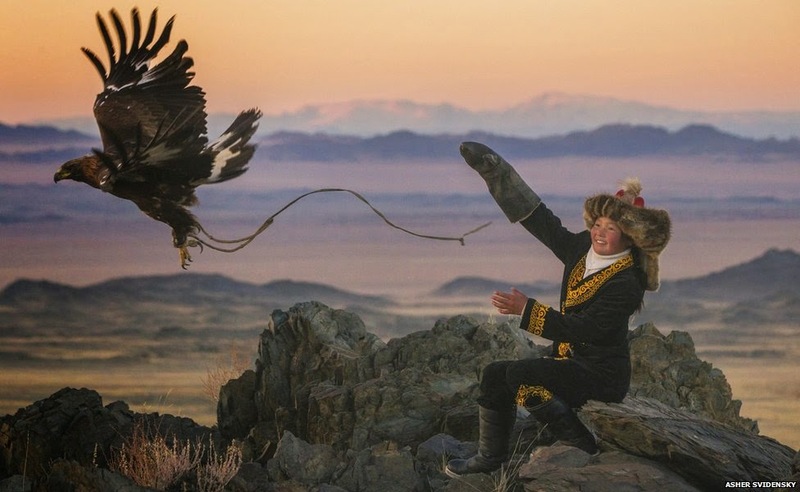 It's not an easy practice, and the Kazakhs are one of the few groups of people that hunt with the eagles. There are only about 400 falconers, and it's a lifelong profession. Most, if not all, of those 400 falconers are males. Svidensky was taking photos for a story about boys learning falconry but started to wonder if any girls also joined in. He came across Aksholpan, and on his blog, Svidensky says, "I was amazed by her comfort and ease as she began handling the grand eagle for the first time in her life. She was fearlessly carrying it on her hand and caressing it somewhat joyfully." At some point, she apparently asked to be trained. Golden eagles weigh anywhere from 8-14 pounds. That is quite a bit to hold on your arm when you're a teenager, and the sheer force of the bird has to be a lot to handle. Aksholpan, you rock.